You might not realize it, but having pests in your home can be more than just a regular nuisance. In addition to spreading germs and bacteria, as well as compromising the safety of your home, pests can cause health problems. Sinus problems and allergies can already be a major concern to individuals. Did you know that it might not just be plant and dust related though? Many common pests can also cause allergies, and these can effect both you and your family. Rodents – Though you might associate rodents with food theft and contamination and germs, rodent by-products can cause immune responses in sensitive individuals. This can be caused by direct contact with the skin of a rodent, or its saliva. More likely and of much greater concern is that rodent urine can also produce an allergic response. Rodents typically mark areas to advertise their availability and simply because they like it when an area smells like they do. You can imagine how quickly a problem like that can get out of hand. Symptoms can be as mild as a runny nose or as severe as to simulate asthma, so if you believe you have rodent related allergies it’s best to call see a doctor for testing and call an exterminator to determine whether or not you have a rodent problem. Cockroach – Like rodents, people with allergies to cockroaches can have allergic responses to saliva, feces, and the body of the cockroach itself. There is a giant difference between cockroach and rodent allergies however. Cockroach allergies tend to effect asthma suffers much more often and can increase over time. Theses responses include itchy skin, throat, eyes and nose, as well as respiration problems. Cockroaches can even trigger asthma attacks, so if you suffer from asthma or live with someone who does it’s even more important to have your home looked at by a professional. Doctors can diagnose cockroach allergies with a skin test, and the first step to remedy this problem is always eradication of the cockroach infestation. Bees – Many people know someone who is allergic to bees, and that an epinephrine shot needs to be carried with them at all times. Did you know there are a number of things you can do to to prevent bee stings though? Don’t swat bees, you want to brush them off your body or wait for them to fly away. Cover garbage cans outdoors. Avoid bright clothes and sweet scented perfume or cologne. Wear gloves, shoes, and socks when you do yard work. Reduce skin exposure when outside. If you have bee allergies, extermination by an experienced company can also help rid your property of these pests. Now that you know what to look for, make sure to keep yourself and your loved ones safe from allergy causing pests. 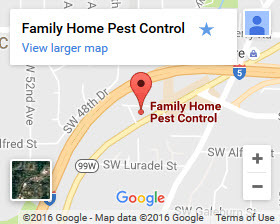 If you need help with any of the pests above, contact Family Home Pest Control today.